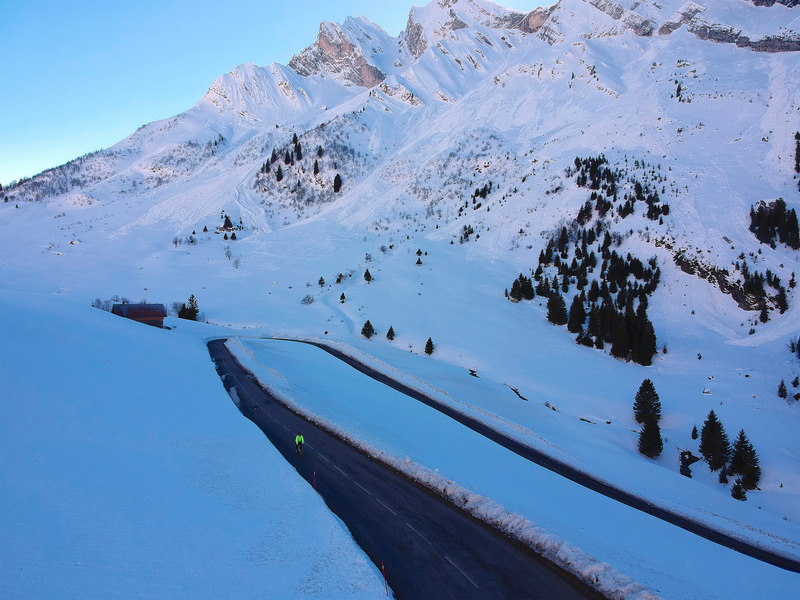 An annual tradition: climb the west side of Col de la Croix Fry on a sunny winter day and continue on to Col des Aravis. 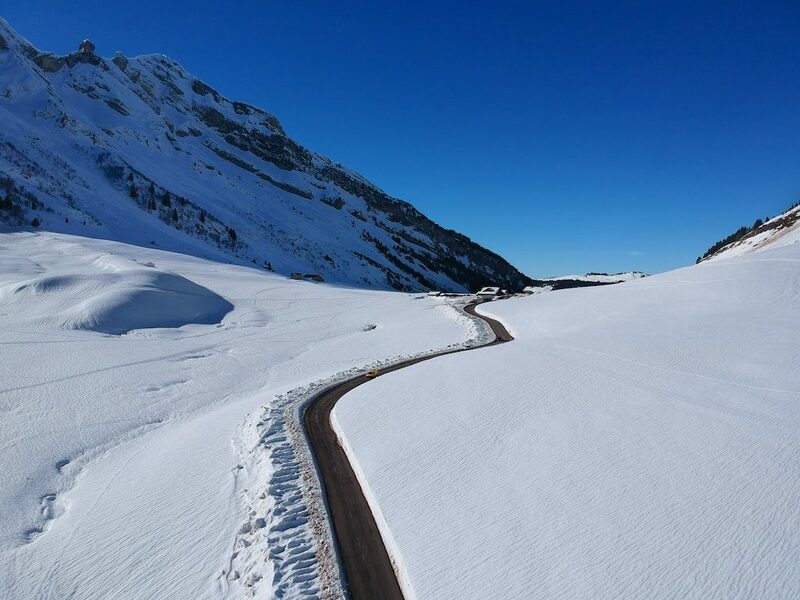 The road to Croix Fry is (almost) always open due to the skiing at the summit. 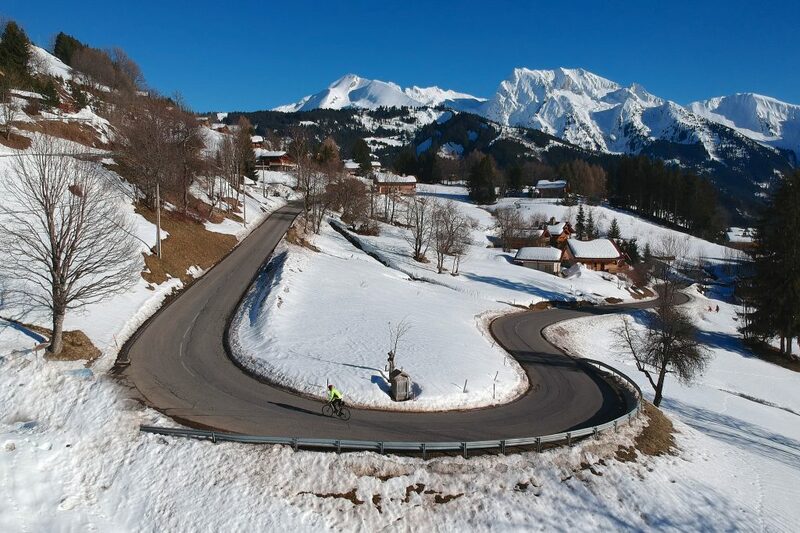 Col de la Croix Fry will be in the 2018 Tour de France in a gigantic north Alps stage that is also the Etape du Tour. I wrote a detailed route preview here. For the past eleven years, I have taken a photo from the exact same spot (above Manigod), resting the camera on a recycling bin. Here’s my 2018 submission to the collection (a few old ones at bottom of post). I love this view of L’Etale. The west side of Croix Fry is bathed in sun. But the east side can be very cold, dark in winter. I always wait for a nice sunny winter day to avoid ice here. 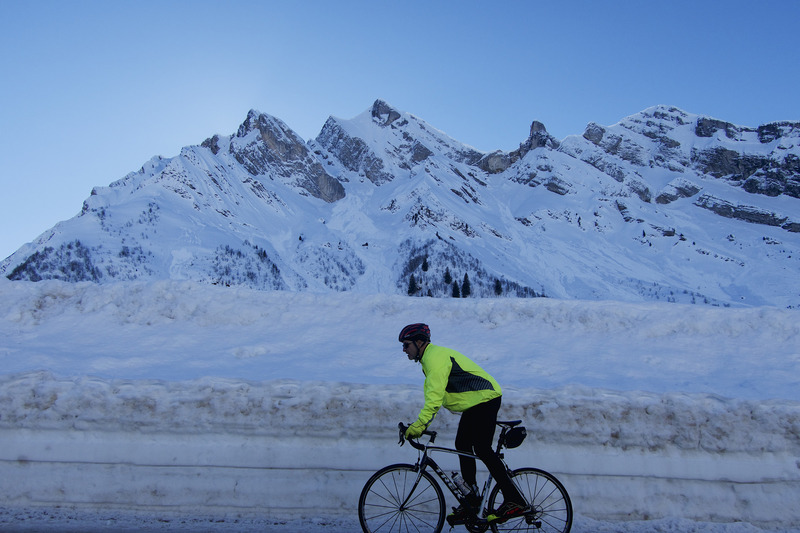 But the temperature dropped 9 degrees in a half kilometre. 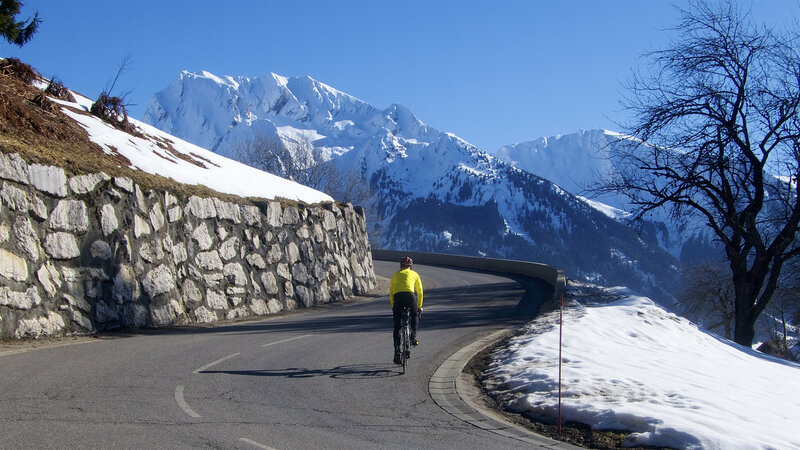 An excellent (tougher) alternative to the bottom half of Croix Fry is to start with the lesser known, steep, beautiful Col de Plan Bois. 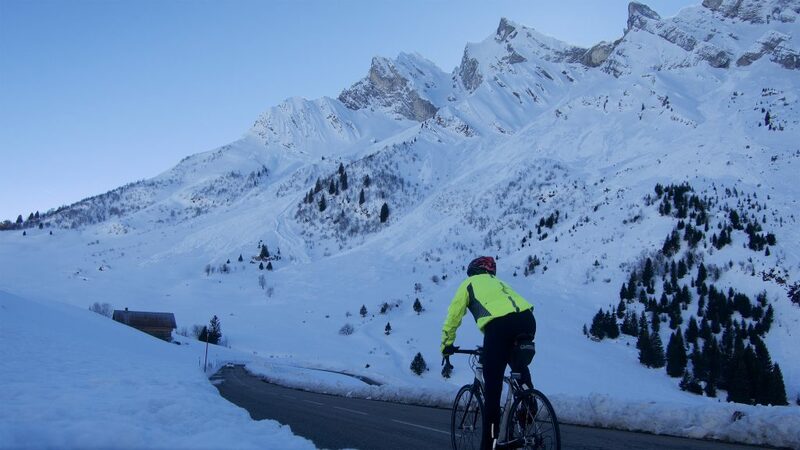 It rejoins Croix Fry before the best kilometres. But it requires a snow traverse this time of year (not too tough), and I felt less ambitious today. But details here. 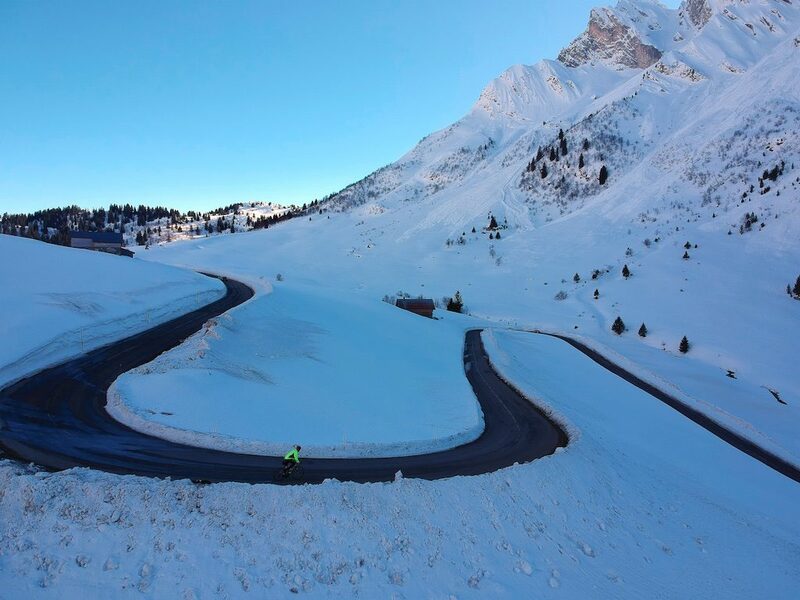 As detailed on the map below, from Croix Fry it’s just a short descent to the main Route des Grandes Alpes road that climbs to Col des Aravis. My route joined the route at roughly 1250 metres, so it’s only a few kilometres to the Col at 1487 metres. It doesn’t get much sun in winter, but it’s beautiful. I kept things simple and just doubled back from Aravis. 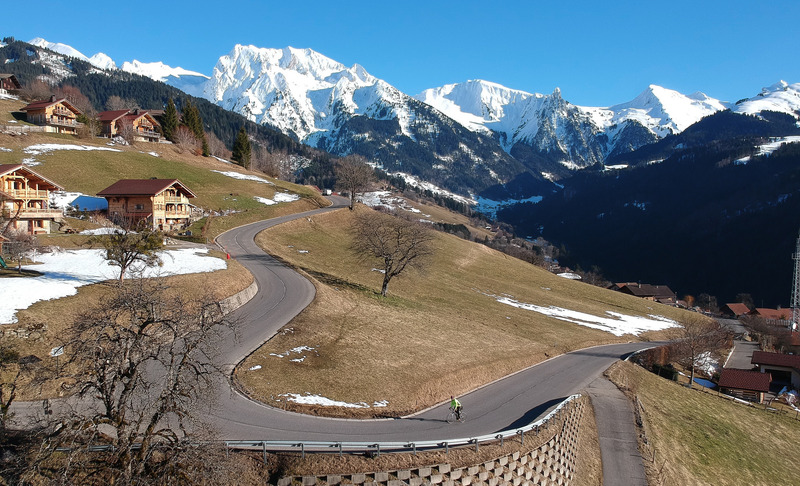 But it’s possible to make a big loop, descending the far side of Aravis, through the gorge on the far side, returning via the Annecy bike path then Col de Marais – see the map in this 2016 post. A great ride. 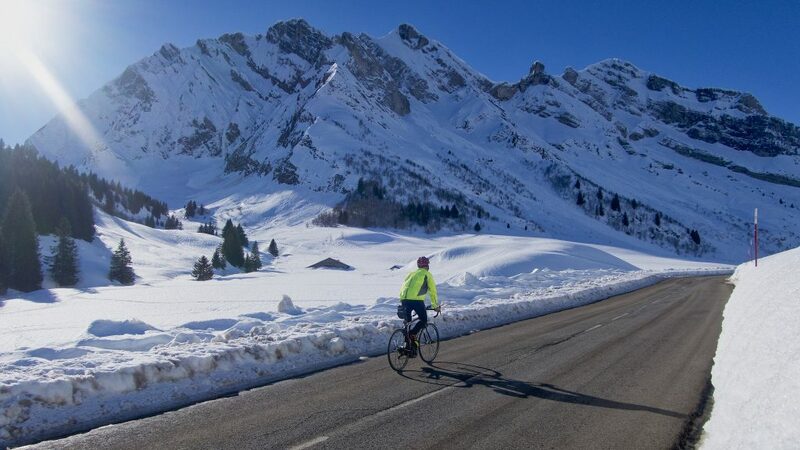 Col de la Croix Fry and Col des Aravis don’t make the top of many “best Alps climbs” lists, but in winter they are glorious. At this time of year, I’m fine with the ride up, but it’s the downhill part that worries me. How safe is the ride down? It’s not necessarily the time of year. It’s the recent weather and how important the road is. The road here was fine. But it was above freezing and there’d been a couple of days of warm weather and no precipitation, and it’s an important road so it gets well cleared. Croix Fry west side gets nothing but sun all day, so it was no risk. Aravis north side is always a bit riskier as it gets virtually no sun in January. Frankly, it’s probably a better choice in March. But again, the important thing is to keep in mind the past two or three days weather, and the days’ temperature. Wow , just amazing how wonderful your pictures are. This year we will return for the 5th time in a row @ Lac D’Annecy. Col de la Croix Fry is always on the list to climb at least once every time we are there. Last year we also did Col de Plan Bois west side for the first time, hard climb but also nice to do when you’re in shape. Stunning pics! Cheered me up after a rubbish day (also a tad jealous as usual!). Thanks for taking the effort to record and share your rides and knowledge.